The image to the left (how to make a shinobigama) is taken from the ninpiden; 1560 by Hattori Hanzo. 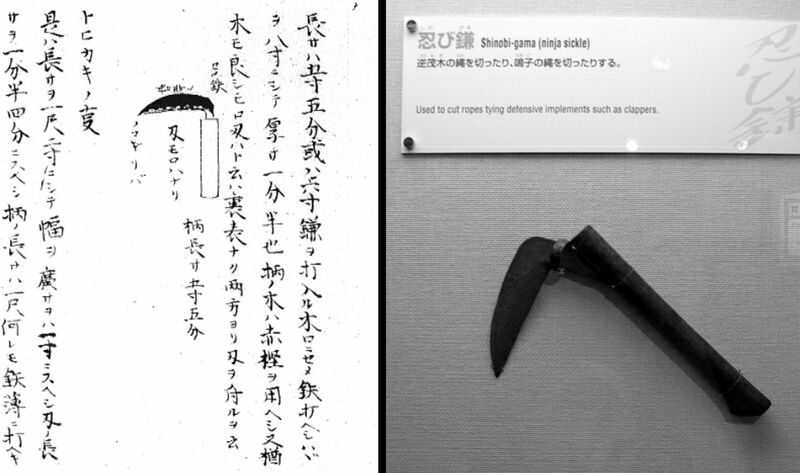 Image to the right depicts a shinobigama taken from the Iga NinjaMuseum. The blade should be 5 Sun (approx 15cm) in length and 9 Bu (approx 2.7cm) in width and should be made with a double edge on both sides. The handle should be 5 Sun (approx 15cm) and 5 Bu (approx 16.5cm) or 6 Sun (approx 18cm). The end of the handle where the blade is should have a ring clamp of 8 Bu (approx 2.4 cm) and should be 1 Bu (approx 3mm) in thickness. To make the handle the wood from the Japanese evergreen oak; however you can also use the wood from the red cinnamon tree or the wood from the nara oak tree as well. The blade should be “V” shaped and symmetrical. * Refer to the drawing on the right for the final shape of the kama. * Hattori Hanzo made a mistake in the beginning of the text, setting the length of the blade at 5 “Bu”. This seems too short for a blade; however the measurements written next to the drawing reads 5 ”Sun” which is more appropriate for this shinobi tool. * The term that is used in the text to indicate that the kama has a double edge is moroha (両刃). 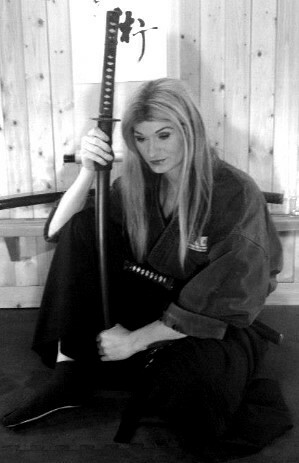 Although Hattori Hanzo uses the term, which translates double-blade or double-edge, it does not mean two sharp edges. To understand this better, one should read this as one sharp edge that is sharpened on both sides. So when you sharpen the blade, sharpen one side of the bottom of the blade, then one side on the top of the blade, this is also to be understood that the sharp edges are on opposite sides of the blade. * It is noted that even though artistically Hattori Hanzo does not draw the kama with a “V” like image, he does state that the blade should be “V” shaped. This is easily understood when looking at the shinobigama that is displayed in the Iga Ninja museum. HARD COPY AND DOWNLOAD AVAILABLE! I hope that you enjoy the new magazine! Thank you all for your support! *note* This is also found in the Shinobi Yoshimori Hyakushu written in 1612. If you enjoyed the quote, you can get all 100 of the Shinobi Yoshimori Hyakushu in this book here! Along with a full translation of the Ninpiden and the Gunpo Jiyoshu! Art is the desire of a person express them self, to display and share the reactions of their personality to the world. In this photo I wanted to use the contrast of the room so that people would look at the arts behind me, yet keeping my body / silhouette directly of the middle of the picture, to help with the “IN / YO” of the photograph. Just as the screen behind me shows the dramatic difference between tiger and dragon, the photo also shows the contrast between light and dark. This in itself is also a major lesson of ninjutsu. The screen behind me was painted by Kano Tanyu in the edo period (1602-1674) The piece is called Dragon and Waves; Tiger among the Bamboo. This is a short video of actual samurai techniques hon how to defend yourself when a thief comes in to steal your sword! These techniques comes from the book True Ninja Traditions. This book is comprised of three historical text of the ancient ninja! (1) The Ninpiden (secret Ninja Tradition) written by Hattori Hanzo and is comprised of 4 scrolls! (2) The Gunpo Jiyoshu Scrolls which isthe collection of the samurai arts, there are three scrolls of shinobijutsu in this collection and all three scrolls are in the book translated in True Ninja Traditions. 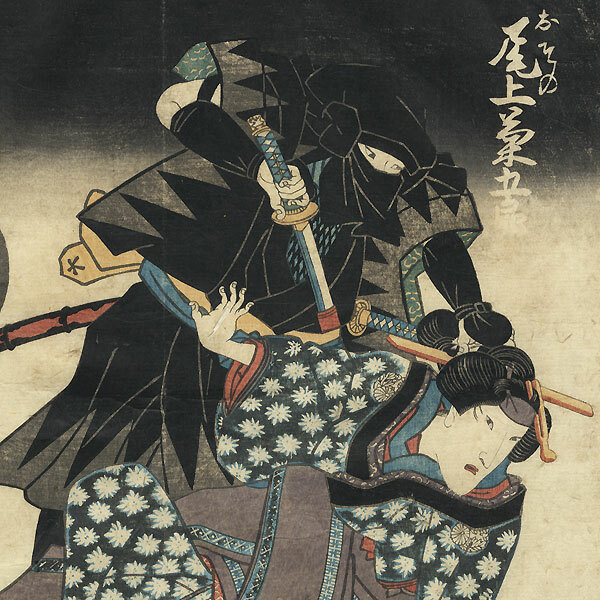 (3) 100 Ninja Poems – These poems were made centuries ago to preserve ancient ninja traditions. True Ninja Traditions is the only book that has all three of these old scrolls completely translated in english in one book! This is for sale on AMAZON! 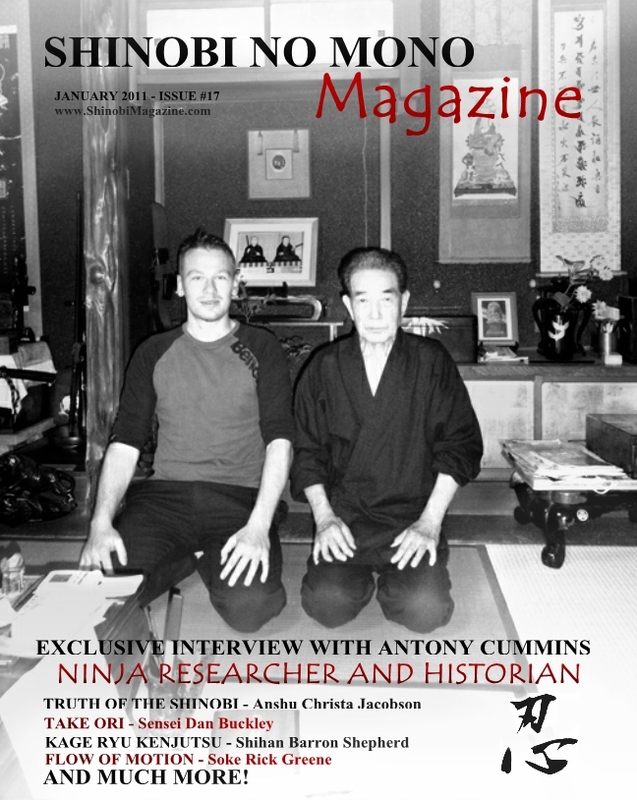 The Historical Ninjutsu Team contacted me and asked if I would do this video and I jumped on the opportunity to help show the world REAL ninjutsu. BUY YOUR COPY TODAY FOR ONLY $5 U.S.D DOWNLOAD!